Central Santa Juana was established from the consolidation of Haciendas San José, Buena Vista, Solá and Quiñones when all were acquired in 1905 by the Belgian firm Societe Anonyme des Sucreries de Saint Jean. In 1927 Central Santa Juana was acquired by the United Porto Rican Sugar Co. who, under the management of Moses A. Walker, also acquired the Juncos , Cayey , Defensa and Pasto Viejo sugar mills. 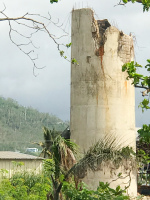 By 1934 United Porto Rican Sugar Co. was under heavy financial difficulty in part caused by Hurricanes San Felipe in 1928 and San Ciprián in 1932, the Great Depression of 1929 and sugar cane strikes in 1933 and 1934 and went on receivership. At auction, it was awarded to National Citi Bank and reorganized as Eastern Sugar Associates. Under the Eastern Sugar Associates umbrella, Santa Juana had its best years. In 1941 it established a sugar refining operation under the name Santa Juana Refinery, Inc. producing the "Blanquita" brand white sugar for the local market. ​ In 1957 Eastern Sugar Associates and Fajardo Sugar Co. decided to merge. In 1957 FaJardo Sugar Co. was acquired by C. Brewer Puerto Rico, Inc. a subsidiary of C. Brewer & Co. of Hawaii who operated it until its closure in 1967. Santa Juana was the only sugar factory possessing a Belgian made 80 HP petroleum engine used to generate electric power to run the crystalizing plant when the steam plants were down. The Turabo University, located about a mile east of the smoke stack, is located in the area known as "Mano Manca" where the sugar mill's administrators residential area was. The three houses pictured below, which date from the sugar mill days, are still in use by the University. Like the office building of Central Juncos , the architecture of the office building pictured is Art Decco, as evidenced by the round corners of the structures above the front windows. The second level, which appears to have been added later, did not keep with the same style of architecture. In 1967 it was dismantled and its machinery & equipment sold in Guatemala where it operated as Santa Ana sugar mill. It's remains are currently located between a densely populated area in the town of Caguas. If not preserved, it should be expected that these remains will soon be demolished due to their location.